On Saturday, October 18th we welcome back Caravan Gypsy Swing Ensemble to our concert series. Caravan Gypsy Swing Ensemble is an instrumental acoustic jazz group based in Madison, Wisconsin. 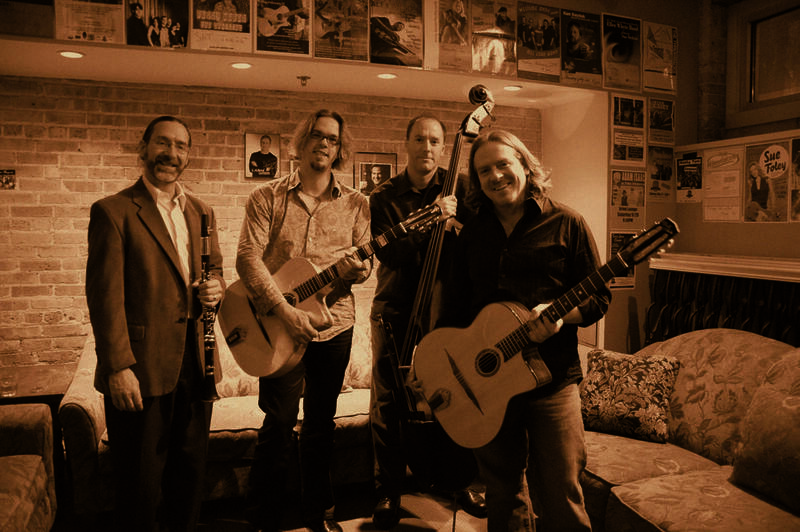 Primarily influenced by the legendary Gypsy guitarist, Django Reinhard, the ensemble also pulls influences from jazz, swing, European folk, traditional Latin, Parisian waltz, and other vintage-jazz sources. Expect a range of tunes from the Hot Swing” repertoire, originals and standards done in uniquely arranged styles. Gypsy Swing was mostly instrumental jazz music created in the 1930s through a unique musical union. When the Manouche Gypsy guitarist Django Reinhardt met French violinist Stephane Grappelli, something magical happened! The music of the American standard songbook of the ’20s and ’30s, European folk music, Parisian waltzes, and traditional Gypsy music were merged to form “Gypsy Swing” or “Hot Jazz.” Their group, “Quintette du Hot Club de France,” quickly became a sensation! They offered a fiery improvisational alternative to the more arranged Big Band sound of the day. They are the defining ensemble in the genre and are looked to for inspiration by countless groups that came after. Although many instrumental lineups exist, a group modeled on the original Reinhardt/Grappelli quintet, including one lead guitar, violin, two rhythm guitars, and bass, is often the norm. Guitar and violin are the main solo instruments, although clarinet and accordion are also regularly used. The rhythm guitar is played using a specific unique percussive technique, called “la pompe,” that essentially replaces drums. This rhythm technique is paramount to the style and largely defines its sound.